But the house was not so simple inside. It had seen things over the hundred or so years that it had been standing in Ann Arbor, Michigan, that were slowly revealed throughout the novel. It had seen hopes and dreams, children and parents, wives and husbands, fighting and crying and trying to find their places with one another. When Stuart and Kate buy the house, at her insistence, they have no idea that it was once the scene of a murder. Stuart never feels right about it, but Kate pours her heart and muscle into its repair. As she builds the house up, their marriage crumbles down, and we struggle through our own memories of home, or own hopes for the future, or own futility in being able to protect ourselves against any eventuality. Born and raised in Rockford, Illinois, Valerie Laken has lived and worked in Moscow, Russia; Prague, Czechoslovakia; Krakow, Poland; Madison, Wisconsin; Iowa City, Iowa; and Ann Arbor, Michigan. She received an MA in Slavic Literature and an MFA in Creative Writing from the University of Michigan. Her work has appeared in Ploughshares, the Chicago Tribune, Michigan Quarterly Review, the Alaska Quarterly Review, the Antioch Review, and Meridian. Her honors include a Pushcart Prize, the Missouri Review Editors’ Prize, two Hopwood Awards, and an honorable mention in The Best American Short Stories. I've been reading about this book all over. I bought it for my Kindle the other day and hope to read it soon. I love your summary of the book and think it is a book that I should enjoy reading. Thank you! I added this to my wish list a week or so ago. Thanks for sharing your thoughts! This books sounds really interesting! Looks like something I will enjoy. Thanks for the review! I can't decide whether this book would entertain me or bring me down. I'll keep following it around to see how I feel. Nice summary! This sounds like a really fascinating book. 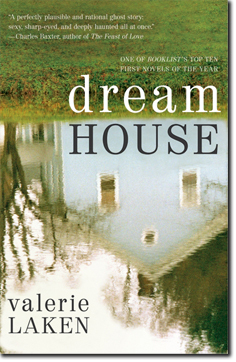 I'm always interested in stories that revolve around a particular house. Alice Hoffman's Blackbird House comes to mind, as does the short story by Ray Bradbury, "August 2026: There Will Come Soft Rains." I hope my library gets a copy of this one! In a way, it reminded me of Anne Rivers Siddons The House Next Door, although that was more of a ghost story than Dream House. Still, there's the power that a house has over us explored in those two novels, as well as The House of Sand and Fog. I've not read Alice Hoffman's Blackbird House, or Bradbury's short story. Thanks for those two titles, Andi! I don't think I could live somewhere if I knew a murder had been committed there. I'm adding this book to my wish list because it sounds so good and because my mother's from Rockford and I still have 2 cousins there. It's interesting the power a house can have over us. I wonder if Kate subconsciously knew her marriage was crumbling? You've given me a lot to think about and I haven't even read the book! Thanks for being on this tour! This sounds amazing. I just added it to my wish list. Thanks for sharing! Reading the quotation from p.131 about having the vision and power to stop ourselves, turn around and go back where we came from, I hear distinct echoes of T.S. Eliot and would be curious to know if the author wasn't influenced by these lines from Little Gidding which have implanted themselves in my own heart:We shall not cease from explorationAnd the end of all our exploringWill be to arrive where we startedAnd know the place for the first time…You also might be interested in one or more of artist GC Myers' posts about the meaning of home in his painting. You can find one good post here.